Blacks living with HIV/AIDS are less likely to be linked to prolonged medical care and treatment. Just in time for National Black HIV/AIDS Awareness Day. A new report from the Centers for Disease Control and Prevention (CDC) found that African-Americans living with HIV/AIDS are less likely to receive ongoing and consistent medical care. Only 38 percent of African Americans got consistent HIV care from 2011 – 2014, compared to about 50 percent of white and Latino Americans. Black men were less likely to receive consistent medical care than Black women (35 per and 44 percent, respectively). 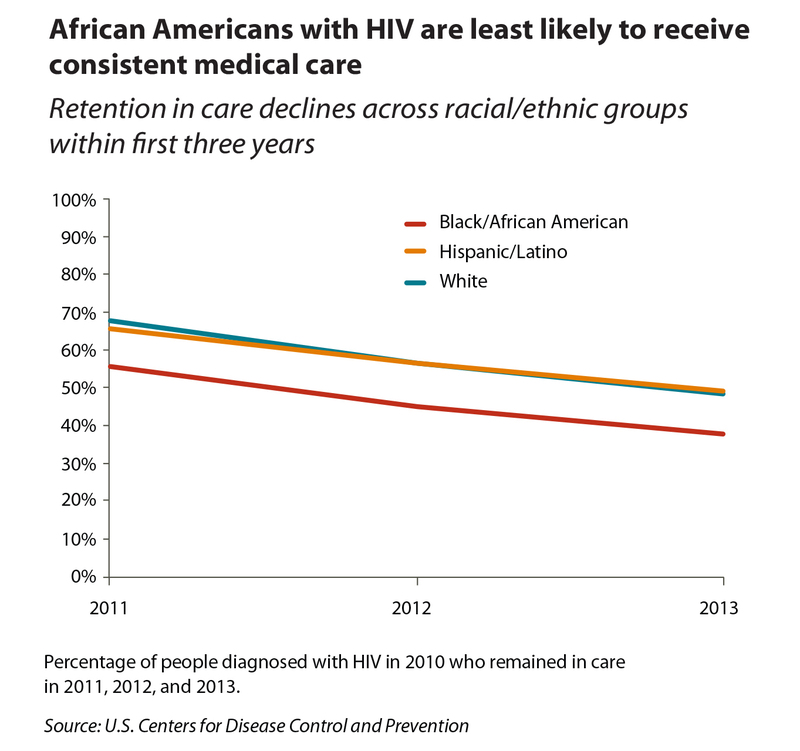 Consistent retention was highest among African Americans whose HIV infections were attributable to heterosexual contact. First, the advancement of HIV treatment—antiretrovirals—is what helped turn HIV from a death sentence to a chronic manageable disease. Treatment saves lives and improves the quality of life by suppressing the virus in a person’s system. For African-Americans, who only account for 12 percent of the U.S. population, but almost half of newly diagnosed infections each year, these low treatment rates means that we are more likely to be sick and succumb to complications of AIDS. But it’s also important to point out that consistent treatment and care protects the community at large. The more a person’s virus is suppressed, the less likely they are to transmit the virus to someone else, which means lesser folks newly diagnosed with the disease. Think: Treatment as prevention. This is why these findings are important when you look at how spotty treatment is linked to HIV transmission. A 2015 CDC study found that at least 90 percent of HIV transmission currently comes from people who are diagnosed with HIV, but not retained in care (69 percent), compared to people who have HIV and don’t know (23 percent). “Consistent care matters. It enables people with HIV to live longer, healthier lives, and it prevents new infections,” said Jonathan Mermin, M.D., director of CDC’s National Center for HIV/AIDS, Viral Hepatitis, STD, and TB Prevention. While the study itself doesn’t explain why treatment retention is so low among African-Americans, we’re pretty sure that lack of access to quality health care, poverty, stigma and the lack of HIV docs (especially in the South), all play factors for why this racial treatment disparity exists.